A problem peasant women face is invisibility in the feminist and women’s movements. 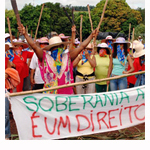 A second problem is the weakness with which the food sovereignty concept has dealt with the challenges of feminism. Food sovereignty is based on the conviction that each people has the right to make decisions about its own food systems: about its own eating habits; about its production, marketing, distribution, exchange, and sharing; and about keeping food and seeds in the public sphere. If we establish that food sovereignty is how people decide what to produce and under what conditions, our question from a feminist point of view is, then: how do people make decisions? Who decides how power is organized? Probably, in reality we’ll see that peasant women are in secondary roles in decision-making areas.